Ever have one of those books that you really, really want to read and at the same time, you are really, really terrified to read, because what if it doesn’t live up to your hopes and expectations? That was Dreams of Gods and Monsters by Laini Taylor for me. 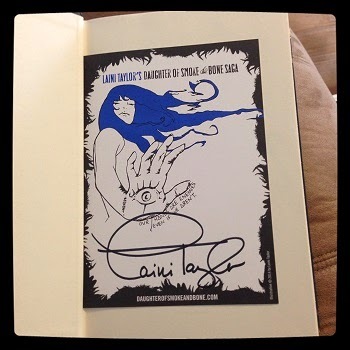 I read the first book in the series – Daughter of Smoke and Bone – back in 2012, and was completely blown away. When the sequel – Days of Blood and Starlight – came out that November, I gobbled it up. It was even better. Then, I had to wait. And wait. And wait. And I began to worry. What if the final book in the trilogy disappointed me, and ruined the whole thing? An irrational fear, perhaps, but when the book released in April, I bought it…and didn’t read it. I kept putting it off. There were other books to read. I needed to reread the earlier books in the trilogy first. Then there was all this moving and packing stuff to take care of. 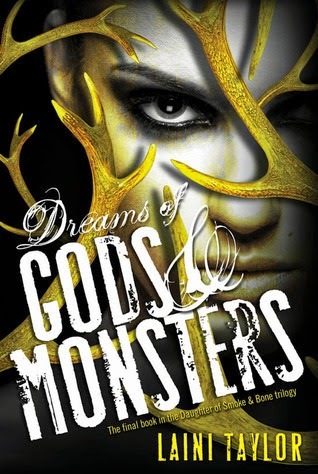 So here it is, July, and while the rereads of the first two books were both brilliant, I still hadn’t picked up Dreams of Gods and Monsters. And so, determined, I picked up the book last week. Ever have one of those books that you want to race through and at the same time, you want to savor and draw out as long as possible? Yes. This book. Dreams of Gods and Monsters. I cannot say just how amazing this book is. This series. Everything. The world-building, characterization, plotting, pacing, depth, writing, everything. Taylor is a master. I had chills running up my arms and legs from the very first chapter. I already want to go back and reread the series with all the new stuff I know now. There are hints that there may be more books written in this world, and that makes me want to dance and sing. This book is, by far, the best book I’ve read this year. It exceeded every expectation. If I had any quibbles with it – and I don’t, not really – it would be that in the latter half of the book, there seemed to be a few strands of plot that didn’t quite get wrapped up (unrelated to possible future books), and a lot of things that happened a bit too fast/random. The reason this isn’t really a quibble is because I honestly think these impressions are my own fault. I read the last 3/4ths of the book in a single afternoon. Racing, not savoring. The last 200 pages went by in a bit of a foggy blur, as my eyes and brain both got tired. Once I reread, slower, I’m sure things will make much more sense and feel less incomplete and random. Because yes, I will definitely be rereading. This is a series that will stay beloved on my shelves for a very long time. This entry was posted in 2014, Prose, Young Adult and tagged favorite, memorable, speculative. Bookmark the permalink.